New Jersey, like most of the other states in the northeast, will yield a small amount of placer gold. This gold is widely distributed and was deposited by receding glaciers, which have come and gone several times over the past few million years. Richer gravels from the Abitibi Gold Belt in Canada were moved south into many states, where deposits called “glacial gold” can be recovered. This gold is almost always found in limited quantities and is very fine textured. The northern part of the state is most likely where gold will be found. Quantities are not significant enough to attract commercial gold mining endeavors, but recreational prospectors can find gold. You probably will not recover enough to cover your fuel expenses, but it can still be a fun way to kill an afternoon. There have been a few reports of potential lode mines in New Jersey, but most research indicates that these were most likely scams designed to trick investors. This was a common practice during the early days, when people would make false claims about gold discoveries to try and make some quick money from people looking to cash in on a rich mining venture. Sometimes these fake mines were salted with gold to trick investors, and other times there was no gold at all. It is believed that most of the claims of rich gold mines within New Jersey likely never existed, as there has not been much interest since that time from serious mining companies. Based on past reports and the limited documentation about gold in New Jersey, it is likely that prospecting for gold in the state is unlikely to produce much more than a few colors. Although it is certainly possible to discover a rich deposit of gold somewhere in the state, it may be more productive to explore some of the nearby states that are better known for their historic gold production. To the west in Pennsylvania, gold has been reported in several counties, with the best known areas being York, Lancaster, and Wyoming counties. These gold deposits are believed to have originated from glacial outwash. Maryland has some many historic gold mines that operated. In fact, many of these mines were located near our Nation’s Capital. Further to the south, Virginia has produced significant amounts of gold, and is one of the better states to prospect on the east coast. Both lode and placer gold deposits can be found here, and if you are serious about finding some gold, it may be worth travelling the extra miles to prospect in a known gold area. 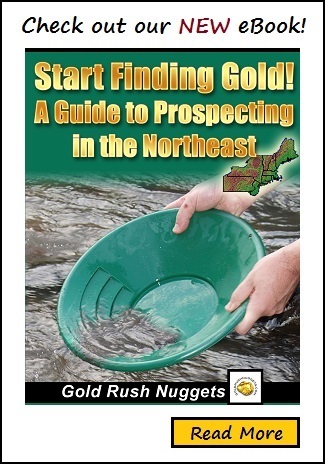 You are not likely to get rich gold prospecting in New Jersey, but there is gold present. When you’re searching for gold here, keep in mind that it is likely to be extremely fine textured, rather than coarse gold nuggets. If you are serious about finding better quantities of gold, consider a road trip to one of your neighboring states.